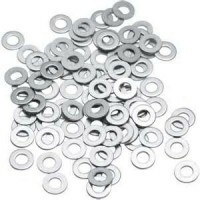 Compatible with our new range of R0883 cut to size rack rails Cupwasher for M6 screw - Re.. Compatible with our new range of R0883 cut to size rack rails Philips Head Screw M6.. Compatible with our range of R0883 cut to size rack rails M6 Cagenut For Rack Rails..
15mm Self Tap Screw Philips Head Black Thread diameter: 3.4mm Pac..
M6 x 9mm Teenut Pack of 20 ..
M8 x 11mm T Nut Pack of 20 ..
M8 x 20mm Hex Head Cap Screw (Bolt) Pack of 20 ..
M8 x 30mm Hex Head Cap Screw (Bolt) Pack of 20 ..
Flat Stainless Steel M5 Washer Ideal to use with Grooved Rivets for extra hold especially whe..